Go green and save some green at the same time "Save Energy and Cut Your Bills" offers you straightforward, achievable cost-cutting and energy saving strategies. 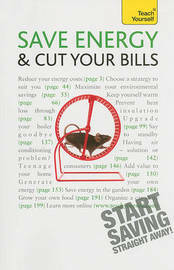 It explains energy legislation and gives various ways to save energy in the home or in a rented property, with practical advice on heating, hot and cold water, electricity and appliances, stand-by systems, lighting, cooling systems--and even how to manage your teenagers' use of energy! With lots of useful tools to assess energy and carbon use, "Save Energy and Cut Your Bills" gives practical advice on everything from heating homes to managing those teenage consumers. It includes: "No cost," "low cost" and "investment" energy-saving actions Detailed installation costs and savings Advice on generating your own power Suggestions on green driving and being more sustainable in the garden You can also visit teachyourself.com for tests, extension articles and a vibrant community of like-minded learners. And if you don't have much time, don't worry--this book gives you one-, five-, and 10-minute bites of learning to get you started.